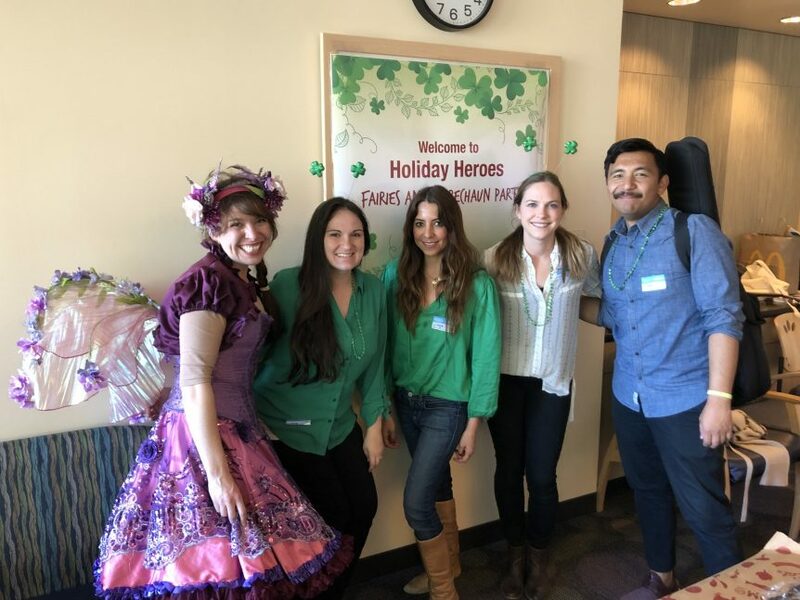 It was so exciting to celebrate St. Patrick’s day at our third party at Children’s Hospital Los Angeles! 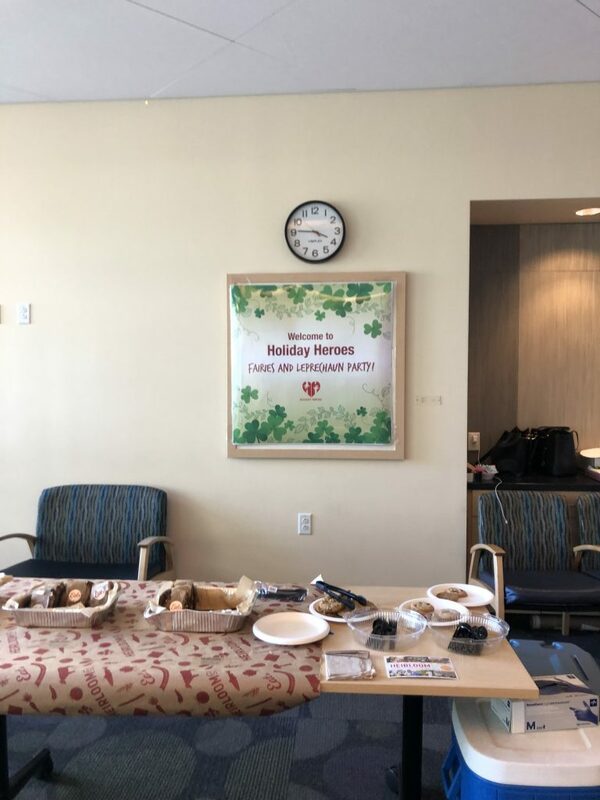 There were 33 caregivers who visited the family lounge to enjoy a meal from Heirloom Catering and Shamrock Shakes from the local McDonald’s. One mom come up and tell us that this was such a nice opportunity to take a little break and be able to enjoy a meal while stepping away from the bedside. A big shout out to our new volunteers, Adey, Mercedes, and Tim! Tim played the guitar and sang songs throughout the duration of the party in the family lounge. It was evident that the music helped to put parents at ease. Adey and Mercedes were excited to with the kids doing crafts and to just be involved with the Holiday Heroes mission! Another huge thank you to the team at FloQast, who sponsored this party and packed the craft kit boxes earlier that morning. They were all so helpful and efficient getting the boxes ready for the kids! We are grateful for our fairy, Sunny, who paid a visit to the hospital to play music and interact with the kids in the playroom! 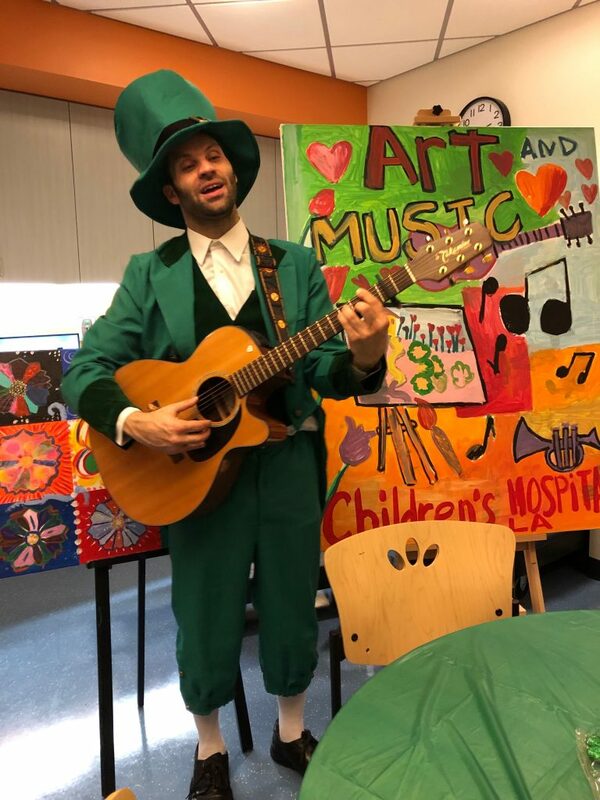 Also, a big thank you to our dedicated volunteer Costis, who played guitar, sang, AND dressed up as a leprechaun for the kids. We always appreciate Sam and Cynthia who are the event coordinators at Children’s Hospital Los Angeles. They are so helpful in the planning process, spreading the word, and helping to get the kids to the party!